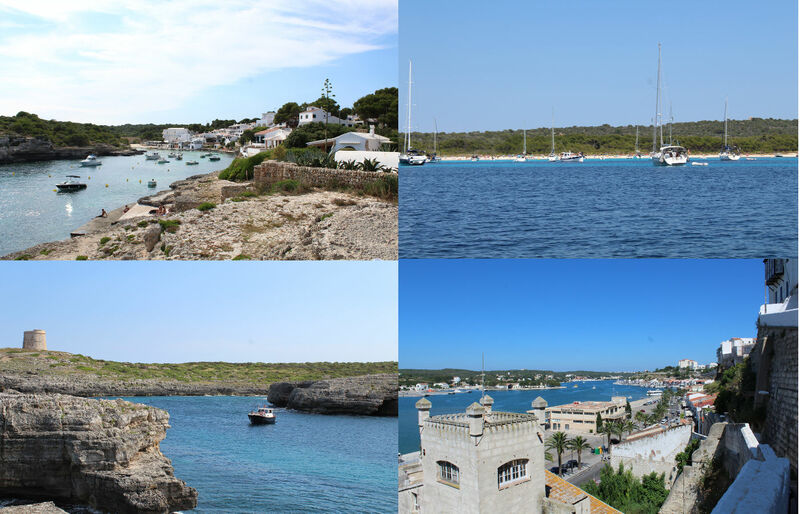 The island of Menorca is the northernmost of the Balearic islands and I was lucky enough to spend some time in a cozy home away from home on this beautiful island paradise. Menorca’s north is perhaps its most captivating and yet rawest quality. The harsh winds have shaped the beaches here to be anything but Mediterranean. You’d feel closer to a walk along the fjords of Norway, especially on a cold day. Everything about Menorca just makes you want to discover and explore more, and on those solitary walks by the beach, you will feel like an actual explorer. Rocky beaches with faces worn out by the coastal winds, secluded lagoons, and white sands leave nothing to be desired, whatever your beach craving may be. Highest point and one of the highlights of the island is El Toro, 358 metres above sea level. It’s a fairly easy hike or bike ride uphill and the view into the far distance of the island with the turquoise of the ocean caressing the horizon is simply outstanding. There’s the cutest little church and a statue of Jesus waiting for you at the peak of El Toro, also. None of that is to say, that you won’t find popular beaches on the island for you to show off your beach body. The most popular ones are à Arenal d’en Castell and Santa Galdana, my personal recommendations though are quiet bays like Cala en Blanes or Cala Blanca. The island capital is Maó (or Mahón in Spanish), it is not only the cultural centre of the island, but also a good place to shop. Due to its long and partially tragic history, Mahón appears to be somewhat charmingly patched together. It was founded as a colony by Carthage, you can still find ancient relics all around the outskirts of the city, but culturally impacted/conquered by Greeks, Vandals, Romans, and even the British Empire. This multitude of cultures really shows in Mahóns architecture and structure, Menorca’s capital simply has its own charm. And there’s not much point describing it in minute detail, you simply have to see it for yourself. All the exploring, venturing across the island, and slacking off at the beach will of course make you long for some luxury. Luckily I got to stay at a holiday apartment/villa by menorcavacations, and it was simply dreamy. I felt right at home amidst the luxury, the apartment was clean (and the housemaid coming in every day helped keep it that way), quiet, and yet only a few metres away from the pool. Ideal if you don’t feel like visiting the beach, or just wanna swim a few laps after hours. The menorcavacations flat even provided a designated parking spot for those of you, that prefer going everywhere in their own rental. Perhaps best of all, free and fast wi-fi, so I could keep all my friends posted about my spectacular vacation, and watch their jaws drop in real time. The apartment itself is comprised of a spectacular living room with a large flat screen tv and some fluffy carpet, a bedroom with a wardrobe, a door leading to the balcony, a small safe, and a queen size bed, a well equipped bathroom (including a hair dryer and a floor-level shower), and a huge, fully furnished kitchen. So whether it is a washing machine, coffee maker, or dish washer you are looking for, menorcavacations has you covered. 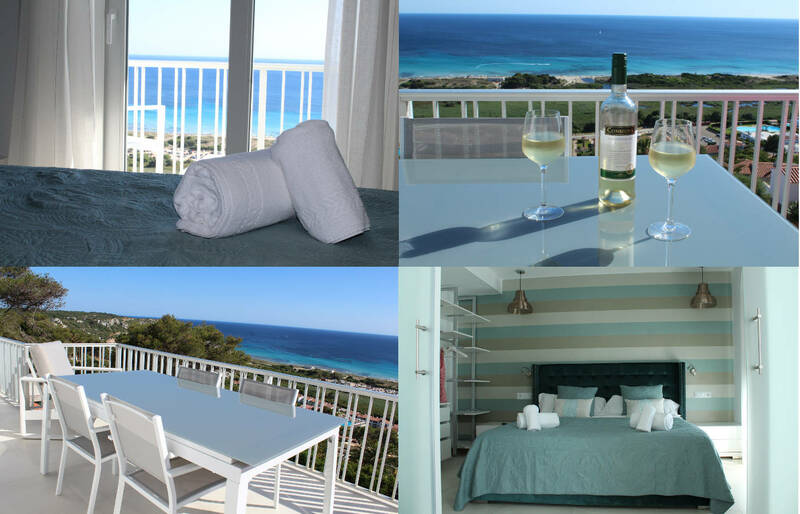 So now onto the beautiful balcony: menorcavacations provides you with a cozy opportunity to just watch the hours pass away and enjoy the view of Son Beau’s coast. Son Beau is the nearest town and your one stop spot to shop, visit a restaurant, or go for a cocktail in the evening. Its beach is only a leisurely ten minute foot-walk, and a few stairs away. White sand glistening in the sun, boat rentals, water sports, and a relaxing dive in the Mediterranean Sea are just some of the things I now get to miss about my all too short stay. 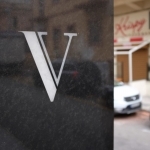 Now, menorcavacations did everything they could to make my stay unforgettable, friendly service, wonderful employees, and a warm welcome – including a yummy welcome basket – made those three nights feel like a taste of heaven. 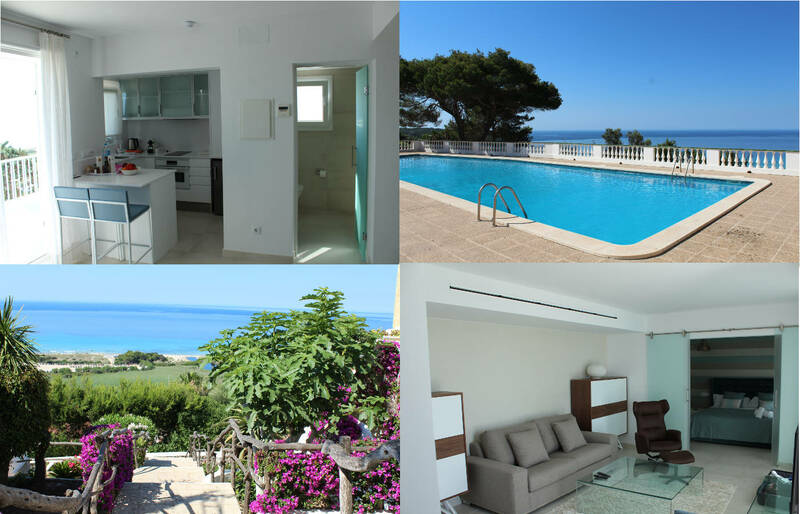 The villa is perfectly suited to relax, watch the sun rise and sink into the ocean. It is luxurious and yet welcoming and I can wholeheartedly recommend it to families and couples alike. It might just be one of the most beautiful places to stay in one of the most beautiful places in Europe. 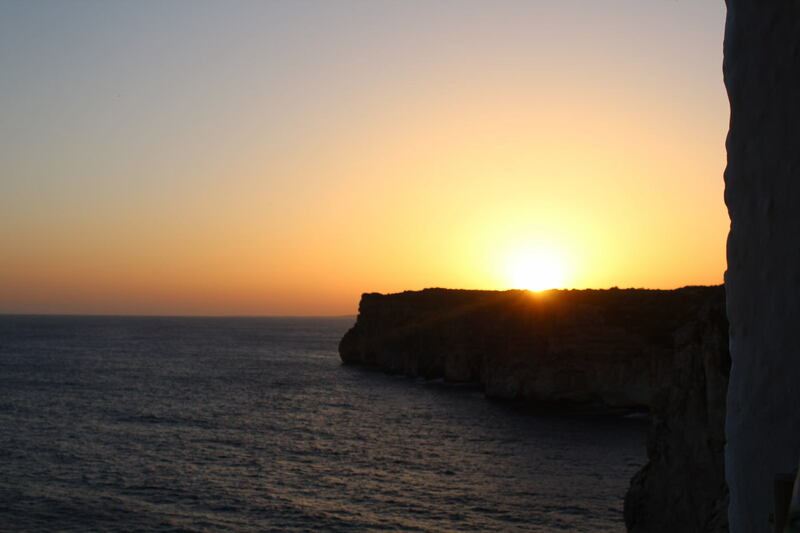 Thanks to menorcavacations my trip to the island was true bliss – when are you coming?